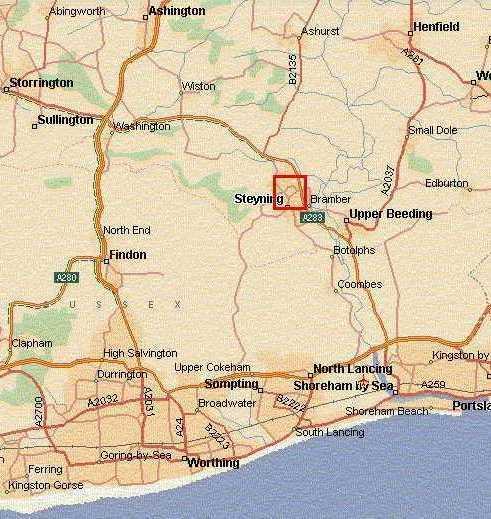 The map below shows the town of Steyning in relation to the river and the other towns around it. The South Downs run horizontally across the map past Findon and Patcham, with a gap for the Adur river flood plain past Botolphs and Coombes. The village of Bramber used to be a sea-port from Saxon times until the Elizabethan era, and Steyning developed as a market town nearby to provide supplies for re-victualling the ships. 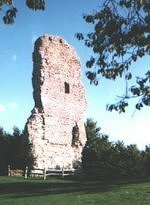 The Norman castle at Bramber (now largely a ruin - see the picture at right) used to have a tidal moat, and St. Mary's House in Bramber (at left) is a relic of that era. Steyning used to support a number of local breweries in conection with sea-going trade, but these have almost entirely disappeared over the years.